Ok, so I might have really started something with my post about how I don’t care if my kids like our homeschool curriculum. Did you catch that one? If not, you can read it here. Then come right back and I’ll tell you a little more about what I care about instead. I care about my teaching style and my homeschool priorities. That’s more important to me than if my kids like my curriculum. I’ll tell you a little secret. Sometimes kids won’t like any curriculum that you choose. Sometimes they won’t even go with you down the rabbit trails of all the interest led learning or fun projects that you implement. Yes, it’s true. Your kids might complain about every single little thing. So, sometimes I say, “Forget this!” And then I choose something that I want to do. And you know what? Sometimes I win them over by my unbridled enthusiasm for a subject. Uh huh, that’s actually happened in my house. I knew that I was winning at this homeschool thing the day that my math-hating child admitted that math wasn’t quite so bad and that she actually didn’t mind it. So, instead of worrying about whether my kids like our curriculum, I think about what I want. I think about what my priorities are for that homeschool year and I choose resources based on whether they help me meet our goals. And I think about my teaching style. 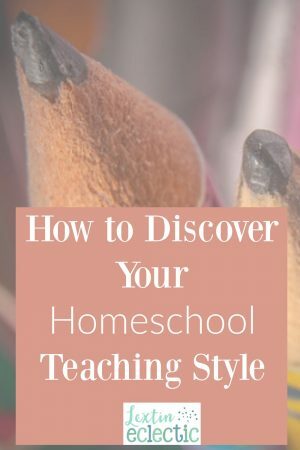 I’ve boiled down the homeschool mom teaching styles to a few different types. Read on and see which one fits you the best. I’ve even titled them with literary references of some of my favorite characters and novels. See if you can guess why I chose each book! This is the homeschool mom who prefers to not only choose her curriculum, she prefers to create it too. She pulls together resources, books, texts, and maps out an entire course of study for a particular subject. She puts in a lot of research hours and prep time to create a homeschool class. This homeschool mom prefers to use prepared resources but she takes a more flexible and delight-driven path. She chooses resources based on topics that she and her children want to study. She’s completely content to spend her time researching new interests each time they come up. She happily follows rabbit trails during her homeschool day. This mom loves projects and hands-on learning. She prefers to teach by doing. She includes lots of crafts, lapbooks, and activities in her teaching methods. She’s happy to jump into her child’s learning by helping with numerous projects and enjoys things such as designing costumes and putting on plays to make history topics come alive. This mom prefers to read and read and read. She enjoys designing or using a curriculum that revolves around books – science is taught through biographies of scientists and history is taught through historical fiction and other non-fiction titles. She even finds literature books to help teach math and language arts. This homeschool mom would rather have plans that are somewhat prepared and ready to go. She wants to be leading the discussions and directing the studies, but she would rather not spend the research hours to prepare the classes – she would rather have helpful teacher notes prepared for her. This homeschool mom wants more than just a little structure, she would prefer lists, guidelines, and even scripted lessons. She is comfortable directing all the lessons as long as the lessons have lots of handholding and teacher resources. She wants her curriculum to be open and go and ready for her to use with very little planning and prep work. This mom feels more comfortable with someone else teaching and explaining a lesson. Or maybe she would like to sit in as a “student” as well so she can learn alongside her child. Either way, she prefers to have lessons written directly to the student – especially if they include DVD’s or computer based learning. This mom takes a more hands-off approach and her homeschooled children work independently. She would rather outsource homeschool classes to another teacher who is in charge of preparing, teaching, and grading. I have a feeling that you’re probably a combination of two or more of the above choices. Or maybe your style changes somewhat each year depending on your homeschool dynamic. That’s exactly how my homeschool has looked – a somewhat crazy blend of teaching styles each year. But, I’m mindful of my needs and my teaching style as a home educator. Yes, it’s really ok to choose curriculum based on which one fits your teaching style. Actually, I kind of recommend it. It’s awesome to use resources that you love. And don’t worry. I don’t completely ignore my children’s learning styles. I do consider what curriculum will work well for each of them, but ultimately I choose the resources that will work the best for me.